WASHINGTON, D.C. — The U.S. adult uninsured rate stood at 13.7% in the fourth quarter of 2018, according to Americans’ reports of their own health insurance coverage, its highest level since the first quarter of 2014. While still below the 18% high point recorded before implementation of the Affordable Care Act’s individual health insurance mandate in 2014, today’s level is the highest in more than four years, and well above the low point of 10.9% reached in 2016. The 2.8-percentage-point increase since that low represents a net increase of about seven million adults without health insurance. Nationwide, the uninsured rate climbed from 10.9% in the third and fourth quarters of 2016 to 12.2% by the final quarter of 2017; it has risen steadily each quarter since that time. 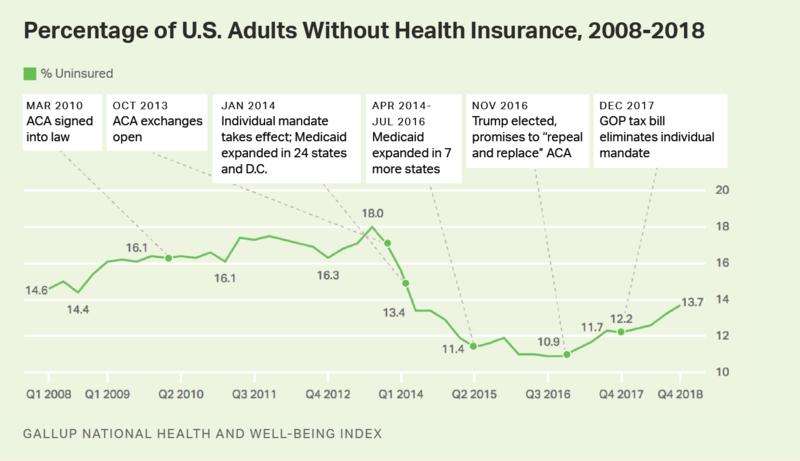 Since Gallup’s measurement began in 2008, the national uninsured rate reached its highest point in the third quarter of 2013 at 18.0%, and thus, the current rate of 13.7% — although it continues a rising trend — remains well below the peak level. These data, collected as part of the Gallup National Health and Well-Being Index, are based on Americans’ answers to the question, “Do you have health insurance coverage?” Sample sizes of randomly selected adults in 2018 were around 28,000 per quarter. The uninsured rate rose for most subgroups in the fourth quarter of 2018 compared with the same quarter in 2016, when the uninsured rate was lowest. Women, those living in households with annual incomes of less than $48,000 per year, and young adults under the age of 35 reported the greatest increases. Those younger than 35 reported an uninsured rate of over 21%, a 4.8-point increase from two years earlier. And the rate among women — while still below that of men — is among the fastest rising, increasing from 8.9% in late 2016 to 12.8% at the end of 2018. Other factors could be a result of policy decisions. The open enrollment periods since 2018 have been characterized by a significant reduction in public marketing and shortened enrollment periods of under seven weeks, about half of previous periods. Funding for ACA “navigators” who assist consumers in ACA enrollment has also been reduced in 2018 to $10 million, compared with $63 million in 2016. Overall, after open enrollment in the ACA federal insurance marketplace (i.e., healthcare.gov) peaked in 2016 at 9.6 million consumers, it declined by approximately 12.5%, to 8.4 million in 2019, based on recently released figures. Other potential factors include political forces that may have increased uncertainty surrounding the ACA marketplace. Early in his presidency, for example, President Donald Trump announced, “I want people to know Obamacare is dead; it’s a dead healthcare plan.” Congressional Republicans made numerous high-profile attempts in 2017 to repeal and replace the plan. Although none fully succeeded legislatively, the elimination of the ACA’s individual mandate penalty as part of the December 2017 Republican tax reform law may have reduced participation in the insurance marketplace in the most recent open enrollment period. Trump’s decision in October 2017 to end cost-sharing reduction could also potentially have affected the uninsured rate. The cost-sharing payments were made to insurers in the marketplace exchanges to offset some of their costs for offering lower-cost plans to lower-income Americans. The Trump administration had previously renewed the payments on a month-by-month basis but later concluded that such payments were unlawful. In April 2018, a federal court granted a request for a class-action lawsuit by health insurers to sue the federal government for failing to make the payments. Such lawsuits continue to be litigated. CMS proposed in its 2020 Payment Notice on Thursday a reduction to exchange user fees and is asking for feedback on a proposals to potentially eliminate auto-reenrollment and “silver-loading,” a strategy used by payers where they pack the ACA’s subsidy-rich silver tier plans in order to make up for losses incurred by the elimination of cost-sharing reduction (CSR) payments. CMS Administrator Seema Verma said in a statement that the rule is aligned with the Trump administration’s healthcare goals, which include lowered premiums, reduced regulations, market stability, consumerism and protection for taxpayers. Critics called it the latest act of “sabotage” on the ACA. The end of silver-loading, a tactic many health plans resorted to in 2018 after the elimination of the law’s cost sharing reductions, could wreak havoc for insurers in the exchanges. President Trump, Senator Patty Murray, D-Wash., said in a statement. is “hurting families left and right.” Murray is the top Democrat on the Senate Health, Education, Labor, and Pensions Committee. “Even 27 days into the shutdown he caused, President Trump has somehow found time to further sabotage health care for patients, families, and women —this time by proposing what would amount to a health care tax on patients and families across the country,” Murray said. America’s Health Insurance Plans praised the reduced user fee, adding the proposed rule focuses on “stability in the individual market.” But it is unclear where the insurance lobby stands on the proposals to potentially end auto-reenrollment and the practice of silver-loading. Between the fiercely competitive midterm elections and ongoing upheaval over the Trump administration’s immigration policies, 2018 was no less politically tumultuous than 2017. The same was true for the world of health care. Republicans gave up on overt attempts to repeal and replace the Affordable Care Act (ACA) through legislation, but the administration’s executive actions on health policy accelerated. Several states took decisive action on Medicaid and some of the struggles over the ACA made their way to the courts. Drug prices remain astronomically high, but public outrage prompted some announcements to help control them. At the same time, corporate behemoths made deeper inroads into health care delivery, including some new overtures from Silicon Valley. Here’s a refresher on some of the most notable events of the year. Texas v. Azar, a suit brought by Texas and 19 other Republican-led states, asked the courts to rule the entire ACA unconstitutional because Congress repealed the financial penalty associated with the individual mandate to obtain health insurance that was part of the original law. District Judge Reed O’Connor ruled in favor of the plaintiffs, creating confusion at the end of the ACA’s open enrollment period, and setting up what may be a years-long judicial contest (yet again) over the constitutionality of the ACA. To learn more about the legal issues at stake, see Timothy S. Jost’s recent To the Point post. The federal and state-based marketplaces launched their sixth enrollment season on November 1 for individuals seeking to buy health coverage in the ACA’s individual markets for 2019. Insurer participation remained strong and premiums fell on average. While some states have extended enrollment periods, HealthCare.gov, the federal marketplace, closed on December 15. After lagging in the early weeks, enrollment ended just 4 percent lower this year than in 2017. While the reasons behind lower enrollment cannot be decisively determined, executive action in 2018 may have contributed. The Trump administration dramatically cut back federal investments in marketplace advertising and consumer assistance for the second year in a row. The federal government spent $10 million on advertising for the 34 federally facilitated marketplaces this year (the same as last year but an 85 percent cut from 2016) and $10 million on the navigator program (down from $100 million in 2016), which provides direct assistance to hard-to-reach populations. Another tactic the Trump administration is using to undercut the ACA is increasing the availability of health insurance products, such as short-term health plans, that don’t comply with ACA standards. Short-term plans, previously available for just three months, can now provide coverage for just under 12 months and be renewed for up to 36 months in many states. These plans may have gaps in coverage and lead to costs that consumers may not anticipate when they sign up. By siphoning off healthy purchasers, short-term plans and other noncompliant products segment the individual market and increase premiums for individuals who want to — or need to — purchase ACA-complaint insurance that won’t discriminate against people with preexisting conditions, for example. Few states have expanded Medicaid since 2016, but in 2018, a new trend toward expansion through ballot initiatives emerged. Following Maine’s citizen-initiated referendum last year, Idaho, Nebraska, and Utah passed ballot initiatives in November to expand Medicaid. Other red states may follow in 2019. Medicaid expansion not only improves access to care for low-income Americans, but also makes fiscal sense for states, because the federal government subsidizes the costs of newly eligible Medicaid enrollees (94 percent of the state costs at present, dropping to 90 percent in 2020). A number of states submitted federal waivers to make employment a requirement for Medicaid eligibility. Such waivers were approved in five states — Arkansas, Kentucky, Wisconsin, New Hampshire, and Indiana — and 10 other states are awaiting approval. At the end of 2018, lawsuits are pending in Arkansas and Kentucky challenging the lawfulness of work requirements for Medicaid eligibility. About 17,000 people have lost Medicaid in Arkansas as a result of work requirements. Public outrage over prescription drug prices — which are higher in the U.S. than in other industrialized countries — provided fodder for significant regulatory action in 2018 to help bring costs under control. Of note, the Food and Drug Administration announced a series of steps to encourage competition from generic manufacturers as well as greater price transparency. The U.S. Department of Health and Human Services in October announced a proposed rule to test a new payment model to substantially lower the cost of prescription drugs and biologics covered under Part B of the Medicare program. Far from Washington, D.C., corporations and technology companies made their own attempts to alter the way health care is delivered in the U.S. Amazon, Berkshire Hathaway, and J.P. Morgan Chase kicked 2018 off with an announcement that they would form an independent nonprofit health care company that would seek to revolutionize health care for their U.S. employees. Not to be outdone, Apple teamed up with over 100 health care systems and practices to disrupt the way patients access their electronic health records. And CVS Health and Aetna closed their $69 billion merger in November, after spending the better part of the year seeking approval from state insurance regulators. In a surprise move, a federal district judge then announced that he was reviewing the merger to explore the potential competitive harm in the deal. The annual report on National Health Expenditures from the Centers for Medicare and Medicaid Services estimates that in 2017, health care spending in the U.S. grew 3.9 percent to $3.5 trillion, or $10,739 per person. After higher growth rates in 2016 (4.8%) and 2015 (5.8%) following expanded insurance coverage and increased spending on prescription drugs, health spending growth has returned to the same level as between 2008 to 2013, the average predating ACA coverage expansions. Continuing a tragic trend, drug overdose deaths are still on the rise. The Centers for Disease Control and Prevention reported 70,237 fatalities in 2017. Overdose deaths are higher than deaths from H.I.V., car crashes, or gun violence, and seem to reflect a growing number of deaths from synthetic drugs, most notably fentanyl. 2018 was the first year after President Trump declared the opioid crisis a public health emergency. National policy solutions have so far failed to stem the epidemic, though particular states have made progress. As we slip into 2019, expect health care issues to remain front and center on the policy agenda, with the administration continuing its regulatory assault on many key ACA provisions, Democrats harassing the executive branch with House oversight hearings, both parties demanding relief from escalating pharmaceutical prices, and the launch of health care as a 2020 presidential campaign issue. Obamacare is precarious yet entrenched as 2019 approaches. Even many of the GOP-led states seeking to knock it down in court would be in a real bind should they succeed. Of the 20 states involved in a high-profile Texas-led lawsuit arguing the Affordable Care Act is unconstitutional, nearly half have already accepted its extra dollars to expand their Medicaid programs or are moving that direction. States don’t have to expand Medicaid under a 2012 Supreme Court decision, but most have found it advantageous because the federal government foots most of the bill. These states — nine in total — would suddenly be facing a much larger expense for hundreds of thousands of low-income earners newly enrolled in Medicaid under the ACA, should last week’s decision by U.S. District Judge Reed O’Connor rolling back the entire health-care law ultimately stand. They include Louisiana, North Dakota and West Virginia, along with Arizona, Arkansas and Indiana, three states that expanded Medicaid but with some modifications. In three other states — Maine, Nebraska and Utah — voters approved ballot initiatives adopting expansion. Yet these states are asking the courts to overthrow not just Obamacare’s protections for people with preexisting conditions – the part of the lawsuit that has gotten the most attention — but also the entire sweeping law, which is now firmly a part of the country’s health-care ecosystem eight years since its passage. More than 12 million people have become eligible for Medicaid since ACA passage, while another 11 million have enrolled in the ACA’s federally subsidized private marketplaces. Developments in the past week — including the court ruling and slightly lagging marketplace enrollment figures released yesterday by the Trump administration — underscore the political divides dogging Obamacare even though Republicans in Congress and at the state level have embraced some of its major components. Nearly 8.5 million people signed up for 2019 plans in the 39 states using the HealthCare.gov website (the other states run their own marketplaces), per figures from the Centers for Medicare and Medicaid Services. Enrollment was just 4 percent less than a year ago, due to a last-minute rush that suggests consumers were undeterred by the court ruling, our Washington Post colleague Amy Goldstein reports. “After lagging by about 11 percent most of the six weeks of open enrollment — a shortened period adopted by the Trump administration a year ago — the more than 400,000 who selected coverage during the final week actually exceeded the year before,” Amy writes. CMS Administrator Seema Verma seemed unperturbed by the reduced enrollment numbers, saying they merely show new GOP and administration policies to roll back some ACA requirements on insurers and consumers are working. But if the entire law gets scrapped by the Supreme Court ( we should note, the case still has a long way to go in the legal system), it will quickly become clear the ACA — for whatever its faults — has extended benefits to Americans they’ve now come to expect. Despite their persistent rhetoric against the law, Republicans have found it politically necessary to embrace big parts of it, including its protections for people with preexisting conditions — and, in some states, its Medicaid expansion. Case in point: West Virginia. Its Republican attorney general, Patrick Morrisey, has joined the lawsuit against Obamacare even though the state embraced its Medicaid expansion, growing its enrollment in the program by nearly one-third.The federal government covers more than 90 percent of the cost of the newly eligible enrollees. When I asked Morrisey’s office about what striking the ACA would mean for Medicaid recipients, his office provided a statement praising O’Connor’s ruling and discussing premium hikes in the marketplaces — but didn’t mention Medicaid. “Our nation must move beyond Obamacare, innovate, provide more choices to consumers, and attack the skyrocketing premiums that have caused such pain and hardship on West Virginian and American families,” the statement said. In some cases, the decisions by state attorneys general to join the anti-ACA lawsuit has put them at odds with their governor. Louisiana’s Democratic governor, John Bel Edwards, moved quickly to expand Medicaid when he took office in 2016. Nearly half a million people have enrolled in Medicaid since then, growing the state’s program by 27 percent. Edwards hasn’t hidden his disdain for Louisiana Attorney General Jeff Landry (R), who has called the law an “unconstitutional overreach.” Edwards issued a critical statement after last Friday’s decision. Officials have made no secret of their disdain for the ACA, so some accused them of making an excuse to destabilize the market. 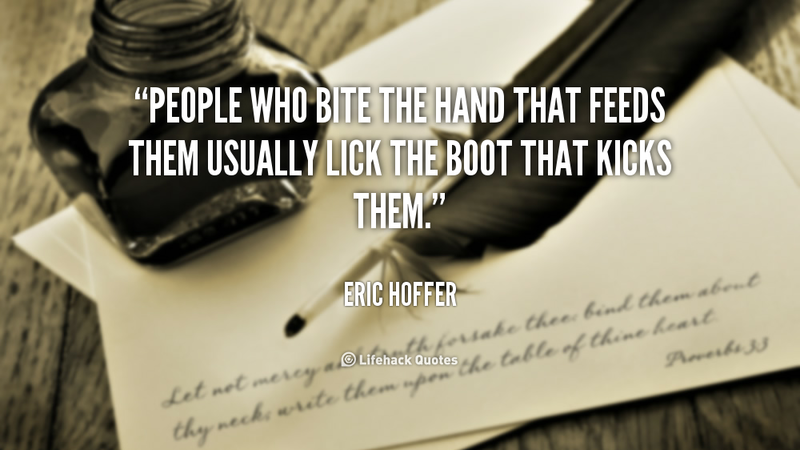 Not so, says the CMS administrator. The fix follows a brief freeze last summer, when the Trump administration said it was just following a judge’s order. The payments are a permanent fixture of the ACA designed to compensate insurers who cover sicker groups. Five months after the Centers for Medicare & Medicaid Services sent a wave of uncertainty across the health insurance industry by freezing risk-adjustment payments, the agency has finalized a fix for the 2018 benefit year. The move seeks to appease a federal judge in New Mexico who ruled last February that the government had failed to justify its methodology for calculating the payments for benefit years 2014-2018. That ruling was the basis, CMS said, for the administration’s decision to freeze payments suddenly last July. The freeze lasted only two-and-a-half weeks until CMS announced a final rule to resume the payments for the 2017 benefit year. That final rule re-adopted the existing methodology, with an added explanation regarding the program’s budget neutrality and use of statewide average premiums. A similar fix for the 2018 benefit year was proposed two weeks later. Risk-adjustment payment policies for the 2019 benefit year, which weren’t subject to the judge’s ruling, were finalized in April. The risk-adjustment payments are a permanent feature of the Affordable Care Act designed to offset the law’s requirement that insurers offer coverage without regard to a consumer’s health status. Since some insurers will inevitably attract sicker patient populations than others, the ACA redirects money from insurers with healthier populations to those with higher utilization. Trump administration officials have made no secret of their disdain for the ACA, so some accused them of using the February ruling as an excuse to inject uncertainty into the market, one exhibit in the menagerie of alleged “sabotage.” Even the nonprofit health plan that filed the lawsuit that prompted the freeze accused the government of making “a purely self-inflicted wound” when it could have instead promulgated a new rule all along. Kris Haltmeyer, vice president of legislative and regulatory policy for the Blue Cross Blue Shield Association, lauded the fix. “The program’s continued smooth operation is vital to ensure access to a broad range of coverage options for millions of individuals and small businesses,” he added. Verma noted that the litigation is still pending. Sen. Patty Murray (D-Wash.) on Wednesday called for reviving bipartisan efforts to reach a deal to fix ObamaCare after an agreement she was part of collapsed last year. “Mr. Chairman, I’m really hopeful that we can revive discussions in the new Congress and find a way past the ideological standoffs of the past,” Murray said to Sen. Lamar Alexander (R-Tenn.), her Republican partner in forging last year’s deal, at a hearing on health care costs. The ground has also shifted since last year, making many Democrats call for bolder action, like expanding the generosity of ObamaCare’s financial assistance and overruling actions President Trump has taken that Democrats say undermine the market.